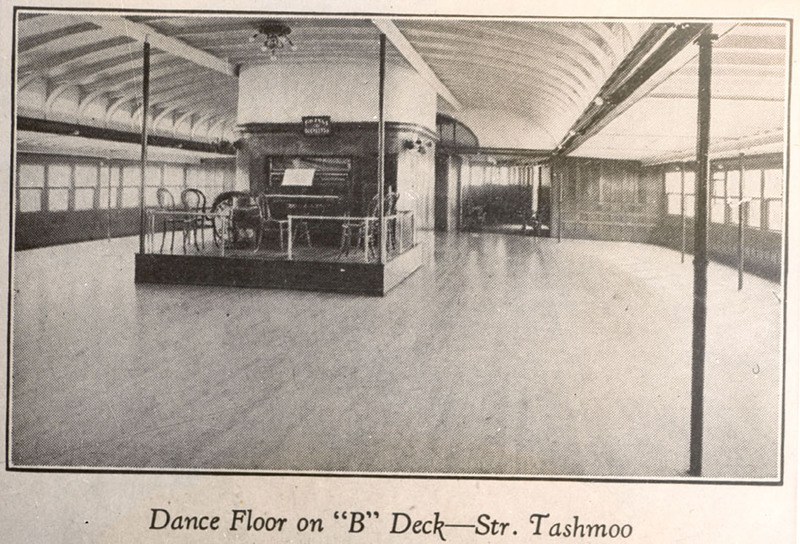 American company White Star Lines operated the Tashmoo or "The Glass Hack," a beloved ship that provided passenger service between Detroit, Port Huron and Sarnia. 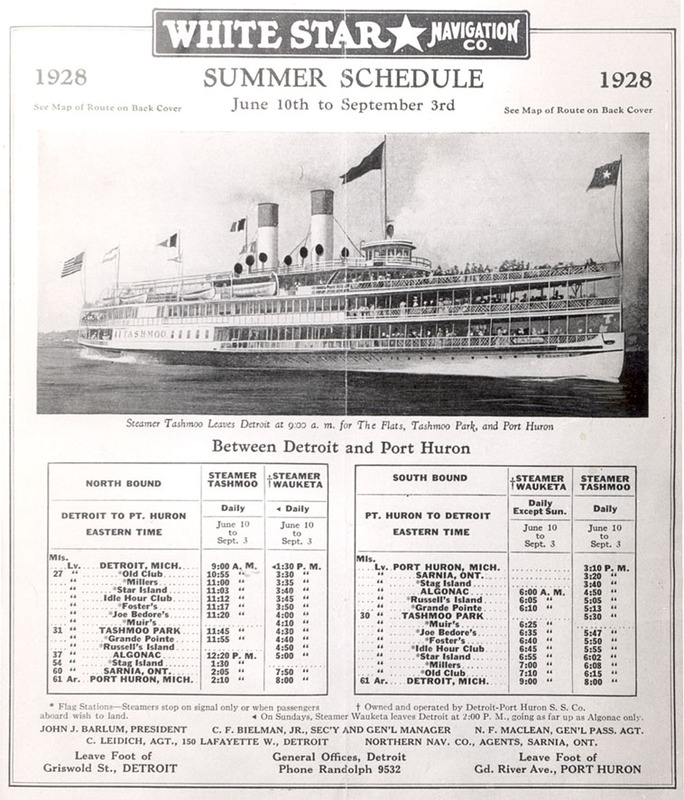 This speedy paddle wheeler took countless Lambton residents on pleasant excursions down the St. Clair River between 1901 and 1936. 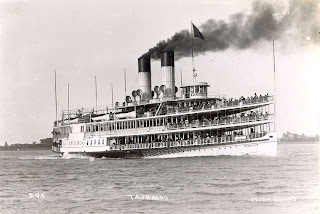 The Tashmoo was built at Wyandotte, Michigan in 1899 and classed as a lake and river boat with a capacity for up to 3,500 passengers. 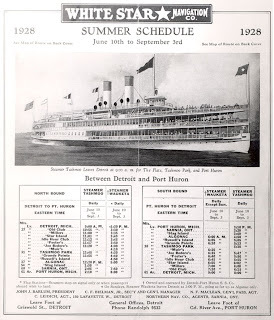 During summer months she made daily excursion trips, and in the St. Clair River alone called at Algonac, Port Lambton, Marine City, St. Clair, Stag Island, South Park, Port Huron and twice at Sarnia. Leaving from Sarnia, a trip aboard the Tashmoo including a stop at Stag Island cost just under a dollar, about 80 or 90 cents. 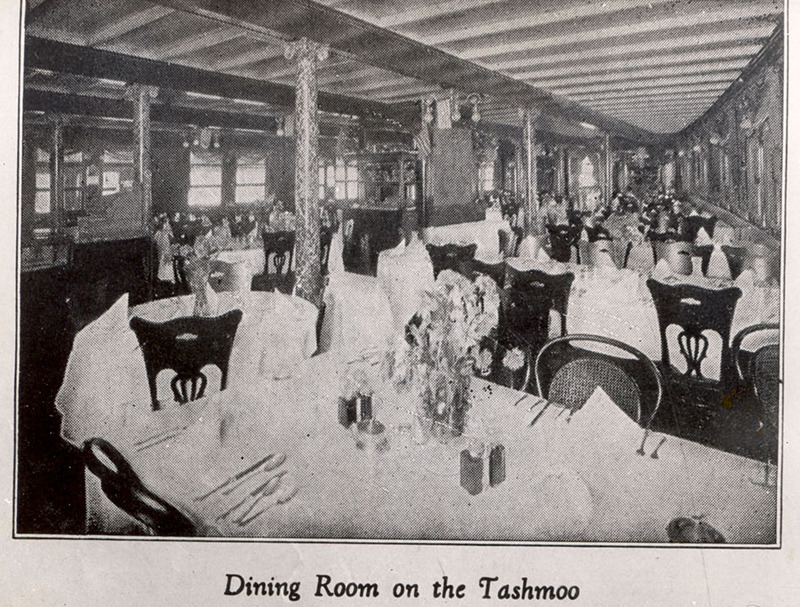 Jean Elford provides a charming description of a passenger's experience aboard the Tashmoo in the evening: "Hundreds of electric lights twinkled and were reflected on the great stretches of glass that enclosed the dining room and ballroom on A deck, the sixteen private parlours on B deck, and the aft portion of C deck. With the rest of her in darkness, she gave the illusion of floating above the water, and as she went the music of Finzel's orchestra added all that was needed to make her wonderfully romantic." In the Sarnia Observer on August 20, 1983, O.N. 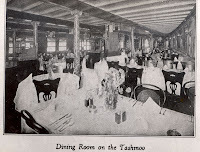 (Red) Wilson reminisced fondly about the Tashmoo: "There are still those among us who dived into the bubbly wake cast up by the paddle wheels when the big ship left the dock. It took a lot of hard swimming to keep from going under the froth that refused to keep the swimmer afloat... 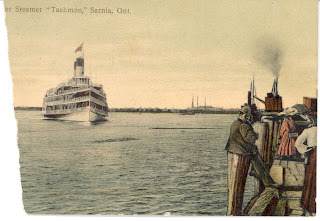 While the ship was docked at Sarnia the 'water rats' dove for the pennies tossed into the water by passengers. The more successful dove, retrieved the slanting coins, tucked them into their mouths and kept right on chasing the money. They did it also with the Northern Navigation boats." The Tashmoo was also known for her speed. After the ship's first summer of work, an official of the White Star Line bragged that she could outdistance the City of Erie or the City of Buffalo. The boasts were taken seriously and on June 4, 1901 a race was set up between the Tashmoo and the City of Erie. Both ships took the lead at some point during the hour-long race, but the City of Erie edged out the Tashmoo with a speed of 21.76 miles per hour to the Tashmoo's 21.70 miles per hour. Unfortunately, Lambton residents would not enjoy whimsical summer nights aboard the Tashmoo forever. In the evening of June 19, 1936 while approaching the Livingstone channel below Grosse Ile, a trembling altered Captain McAlpine. The ship had hit a rock and an eight inch hole was quickly bringing in water. The captain wisely zipped the ship to shore and the crowd went ashore to the music of the orchestra, quite unaware that circumstances were more dire than just an engine malfunction. Once damages were assessed it was determined that the $750,000 price tag it would cost to repair the boat was too high, and the Tashmoo was sold for scrap. She had a wonderful 36-year run and created countless fond memories of airy summer nights.